Appendicitis is an inflammation of the appendix, a finger-shaped pouch which projects from your large intestine on the lower right side of your abdomen. 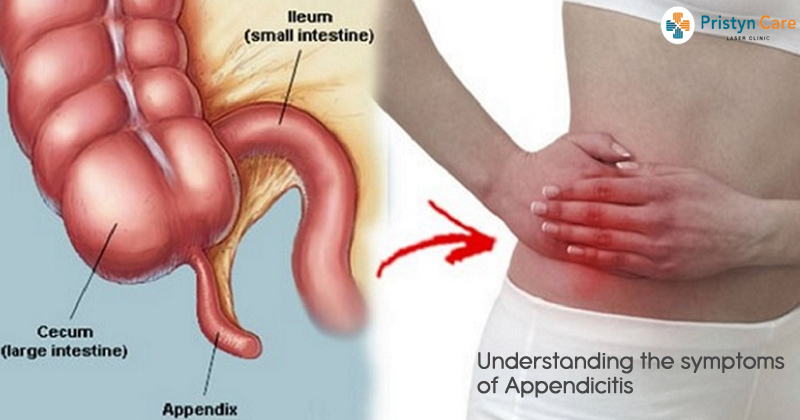 Appendicitis occurs when the appendix becomes blocked, sometimes by stool or a foreign body. The blockage may also occur from infections because the appendix can bulge in response to an infection in the body. Appendicitis can be life-threatening if it bursts, but it can be removed surgically. Appendicitis is a common problem and affects people of any age, but youngsters between the ages of 10-30 are more prone to the problem. The first sign may be a dull pain near the navel or the upper abdomen, and it becomes sharp when it moves to the lower right side of the abdomen. You may get nausea and vomiting soon after abdominal pain starts. Loss of appetite or not feeling hungry for a couple of days is a common problem associated with appendicitis. You may get abdominal swelling due to appendicitis. You may get a fever between 99-102 degrees Fahrenheit. Sometimes, you may find it difficult to pass gas because of this condition. You may get constipation or diarrhea frequently. If you are having any of the above-mentioned symptoms, consult your doctor immediately, as timely diagnosis and treatment are very important in appendicitis. Do not take any painkillers, antacids, laxatives, and heating pads, as it can cause an inflamed appendix to rupture which can be very dangerous.